Firefighting teams in Spain’s Canary Islands are struggling anew to contain forest fires said to have forced some 4,700 people to leave their homes. On the island of Tenerife, the blaze has cut road links and power lines. On the neighboring island of La Gomera officials say the fire has destroyed part of a nature reserve with “incalculable ecological value”. Spain has been hard hit by forest fires after its driest winter in 70 years. 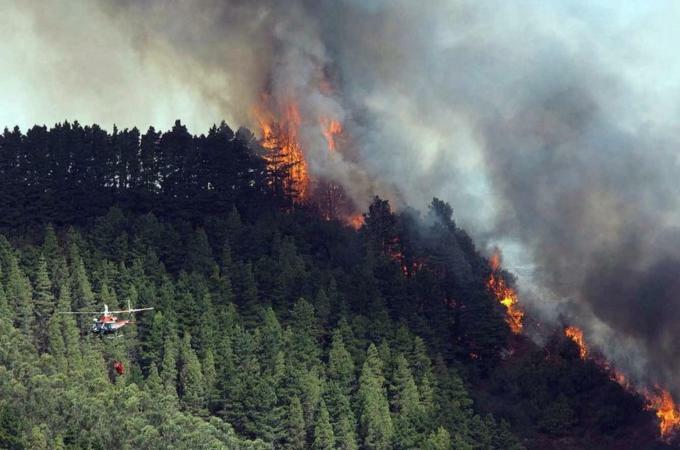 Blazes are also raging in the mainland region of Galicia. Fires first erupted on La Gomera a week ago, but by Monday the blaze was thought to be under control and aircraft used to help put out the flames had even been sent elsewhere, regional official Nancy Melo told the Associated Press news agency. But on Friday the islands’ government said the fire had now intensified, and a fresh blaze had begun on Tenerife. About 2,500 people have been evacuated on La Gomera, along with some 2,200 people on Tenerife, the Agence France-Presse news agency quoted the regional government as saying. On La Gomera, the flames have devoured some 3,000 hectares (7,400 acres) of land, AFP said. That includes a tenth of the Garajonay nature reserve, a UNESCO World Heritage site, some of which is believed to have been in existence for millions of years. Officials have already said it will take at least three decades for the burned areas of the reserve to recover. Firefighters battling the blazes were up against “high temperatures, low humidity and wind” fanning the flames, regional economy minister Javier Gonzalez Ortiz was quoted as saying. The dry winter has been followed by a scorching heatwave. On the mainland, villages have been evacuated in the Galician province of Ourense as more forest fires rage out of control.